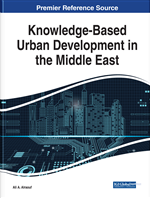 This chapter illustrates the alternative approach to knowledge-based urban development that Qatar adopted to cope with the challenges of the post-carbon paradigm and to construct a new identity as a knowledge-based model of development within the Middle East. Using the capital city, Doha, as the main case study, the chapter provides analysis of the city evolution from the discovery of oil until the contemporary stage where knowledge economy is envisioned as its future and the guiding principle for its urban and architectural projects. The analysis covers the city planning level and how future masterplan is geared towards KBUD and then some influential projects will be assessed. The chapter concludes with a holistic understanding of the case of Doha as a knowledge and creative city that succeeded to craft a new urban brand within the Gulf and Middle Eastern cities. In the last 20 years of the 20th century, Gulf urbanity was mainly characterized by a commitment to use oil revenues to allow primitive, small and simple Gulf cities to rapidly transform into modern status. A process of massive transformation of the endless deserts into real estate mega projects coupled with qualitative upgrade of cities’ infrastructure to get ready for a new modern condition. Observing skylines of cities in the Gulf or tracing their geographical boundaries during the last two decades would prove what diverse researchers have considered unprecedented momentum of development (Kamrava, 2013; Gray, 2011; Davidson, 2008; Alraouf, 2008). Yet, during the last five years, major Gulf cities have emerged as rapid growing knowledge economy localities as they realize the inevitability to go beyond the oil-based economy (Ulrichsen, 2011). The chapter narrates critically the case of Doha, the Capital city of Qatar and illustrates its distinction from neighboring Gulf cities particularly the city of Dubai, United Arab of Emirates. Dubai was a dominant development model for a number of Gulf and Middle Eastern cities in the recent decade (Davidson, 2008; Al-Thani, 2011; Alraouf, 2016). Qatar is now capturing the world’s imagination with a remarkable balance between global aspirations and local necessities. Doha is planned as a future hub in different areas such as education, research, culture, sports and knowledge-based economy initiatives. The chapter illustrates how the urban development is guided by this vison. For instance, the city is becoming the host for an unprecedented assembly of international branch campuses. Additionally, one of the clear directions for Doha’s development is based on transforming the city into a sports hub. This was manifested in the city’s ability to host a considerable number of world class events including the Asian Games of 2006 to the successful bid for World Cup 2022. Consequently, Doha is gradually becoming a knowledge based urban development territory as manifested in the intensive activities of building universities, museums and cultural centers, research institutes, science and innovations incubators and sports and recreational facilities. Clearly, Doha is constructing a new brand based on the authenticity and the credibility of its adherence to the vison towards knowledge as the main governor and generator of its future development. Such vison transcends the typical image of Gulf cities development initiated by Dubai as will be explored. The critical narrative of constructing such a brand is the focus of this chapter. The chapter examines the vision and strategy of Qatar to use its oil and gas revenues to pave the way for a new identity for the city as a holistic manifestation of the knowledge-based urban development paradigm.